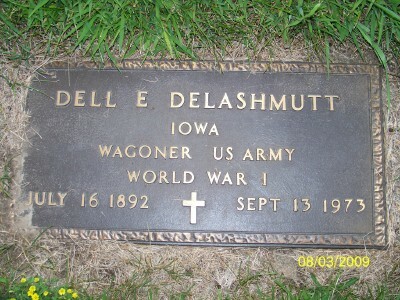 Dell E. Delashmutt's tombstone, Harrison Cemetery, Whiting, Iowa, courtesy of Linda Walker. [S961] Find A Grave, online at http://www.findagrave.com, memorial for Dell Edward DeLashmutt, memorial no. 40273427, viewed on 30 Jun 2011 (naming Elias Nelson DeLashmutt as his father). [S739] Renee DeLashmutt, electronic mail to Roger Bartlett, 16 Apr 2002. [S961] Find A Grave, online, above, memorial for Dell Edward DeLashmutt, memorial no. 40273427, viewed on 30 Jun 2011 (giving the date but no other information). [S739] Renee DeLashmutt, electronic mail to Roger Bartlett, 16 Apr 2002, (giving the city and state but no other information). [S961] Find A Grave, online, above, memorial for Dell Edward DeLashmutt, memorial no. 40273427, viewed on 30 Jun 2011. [S961] Find A Grave, online, above, memorial for Dell Edward DeLashmutt, memorial no. 40273427, viewed on 30 Jun 2011 (information on grave marker). 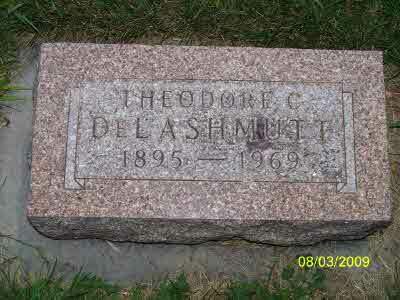 Theodore C. DeLashmutt's tombstone, Harrison Cemetery, Whiting, Iowa, courtesy of Linda Walker. [S961] Find A Grave, online at http://www.findagrave.com, memorial for Theodore Clarence DeLashmutt, memorial no. 40273495, viewed on 5 Jul 2011 (naming Elias Nelson DeLashmutt as his father). [S961] Find A Grave, online, above, memorial for Theodore Clarence DeLashmutt, memorial no. 40273495, viewed on 5 Jul 2011. Gertrude DeLashmutt Dahl's tombstone, Harrison Cemetery, Whiting, Iowa, courtesy of Linda Walker. [S28] James Alonzo Matthews, Jr. and Lucille Pearce, comps., Pearce, Bartlett, Matthews, Smart, and Allied Families (Austin, Tex. : Eakin Publications, Inc., 1983), p. 184 (naming Elias Nelson DeLashmutt as her father). 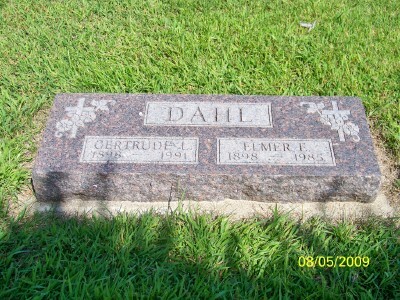 [S961] Find A Grave, online at http://www.findagrave.com, memorial for Gertrude Louise DeLashmutt Dahl, memorial no. 40313378, viewed on 5 Jul 2011 (naming Elias Nelson DeLashmutt as her father). [S961] Find A Grave, online, above, memorial for Gertrude Louise DeLashmutt Dahl, memorial no. 40313378, viewed on 5 Jul 2011. [S961] Find A Grave, online, above, memorial for Elmer Edward Dahl, memorial no. 40313342, viewed on 5 Jul 2011. 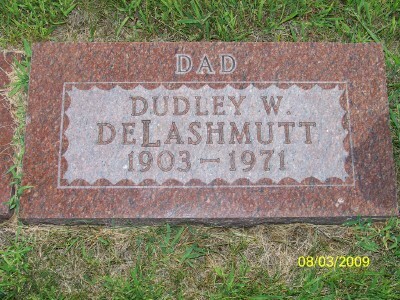 Dudley W. DeLashmutt's tombstone, Harrison Cemetery, Whiting, Iowa, courtesy of Linda Walker. [S961] Find A Grave, online at http://www.findagrave.com, memorial for Dudley Wilson DeLashmutt, memorial no. 40313867, viewed on 30 Jun 2011 (naming Elias Nelson DeLashmutt as his father). [S961] Find A Grave, online, above, memorial for Dudley Wilson DeLashmutt, memorial no. 40313867, viewed on 30 Jun 2011 (giving the date but not the place). [S1430] The Sioux City Sunday Journal, Sioux City, Iowa, online at http://www.newspapers.com, 24 Jan 1971, p. B8, col. 1 ("Rites Monday for Man Shot Accidentally"). [S961] Find A Grave, online, above, memorial for Edith Marie Olson DeLashmutt, memorial no. 40313996, viewed on 30 Jun 2011 (not giving the date or place). [S961] Find A Grave, online, above, memorial for Dudley Wilson DeLashmutt, memorial no. 40313867, viewed on 30 Jun 2011 (not giving the date or place). [S1430] The Sioux City Sunday Journal, above, 24 Jan 1971, p. B8, col. 1 ("Rites Monday for Man Shot Accidentally") (stating that he died at about 10:30 a.m.). [S961] Find A Grave, online, above, memorial for Dudley Wilson DeLashmutt, memorial no. 40313867, viewed on 30 Jun 2011 (giving the place but not the date). Kitty Fay Polly De Lashmutt's tombstone, Harrison Cemetery, Whiting, Iowa, from findagrave.com, courtesy of Linda Walker. 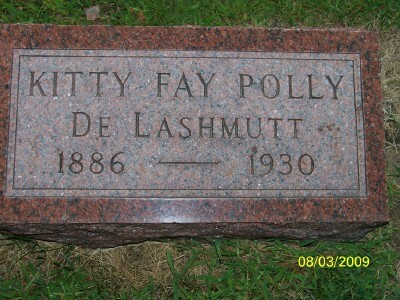 [S961] Find A Grave, online at http://www.findagrave.com, memorial for Kitty Fay Polly DeLashmutt, memorial no. 28217989, viewed on 1 Jul 2011. [S28] James Alonzo Matthews, Jr. and Lucille Pearce, comps., Pearce, Bartlett, Matthews, Smart, and Allied Families (Austin, Tex. : Eakin Publications, Inc., 1983), p. 184.